Age Restrictions: Under 14's must be accompanied by an adult. 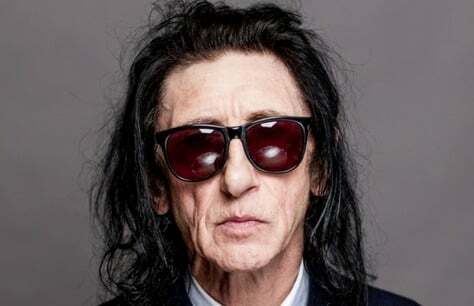 Britain’s best loved poet Dr John Cooper Clarke is heading to the London Palladium on Sat 24 November 2018. The show is a sensational showcase of spoken word –a chance to see John perform material both classic and brand new as he delves into his vast back catalogue, as well as his prolific collection of new work, all read from his trademark battered notebooks, delivered in John’s legendary, rapid fire style and iconic Salford drawl. Combine this John’s hilarious observations, gags and off the wall chat and it adds up to the chance to see a living legend at the top of his game. As we enter 2018, John Cooper Clarke is as relevant and vibrant as ever, and his influence just as visible on pop culture. His influence can also be heard in the satirical and keen social observations of artists such as Plan B and the Arctic Monkeys. Alex Turner, frontman of the Artic Monkeys cites him as a huge inspiration and this was highlighted by the band’s cover of JCC’s I Wanna Be Yours on their critically acclaimed fifth studio album ‘AM’. UK rapper Plan B featured John’s poetry in his directorial film debut ‘Ill Manors’ – their duet Pity The Plight appears in the movie and on the films hit soundtrack.